God never commanded anyone in His Word to tithe money to Tabernacle, Temple, Synagogue or Church. Yet, so many In churches around the world today are lied to every time the offering plate is passed. “God requires you to tithe your money” is spoken from the pulpit. “If you don’t tithe, you are a God-robber! You are cursed!” Is often shouted to put the laity in a state of guilt and condemnation. Relax Saints of God… Fear not. God never authorized that pastor to speak those deceitful and unkind words to your ears. In the above text, two of Aaron’s sons were struck dead because they offered “strange fire” to God upon the altar of the Lord. What exactly was this “strange fire” that they offered that so displeased the Lord? We are not told. But we are given a special insight as to how precise God wants our offerings to Him be. Nadab and Abihu had offered something that God had not commanded. Now, one would think, “Hey, at least they were offering something to God. What wrong can be in that?” But God said they offered something that was not commanded. God has given us His Word as an instruction manual. This “manual” tells us what God expects of us as His dear children. If we are disobedient, God’s chastening hand will be upon us. It surely was upon Nadab and Abihu when they offered strange fire upon the altar. The manner in which we are to live is laid out for us in the New Testament section of the Holy Bible. Now, please don’t go off on a tangent, saying I don’t like the Old Testament. I do. I cherish both the Old and the New. I read them both and learn from them both. But the fact is, the New contains the pattern by which God wants us to live today. Hebrews 8 Was written in AD 66. It reveals to the reader that the Old Covenant was ready to pass away and that God was bringing us into a New Covenant. We cannot live in the Old Covenant promises, curses, edicts, laws, statutes, and ordinances. God doesn’t expect us to. The Apostle Peter spoke before them all, rebuking them for placing a yoke upon the Gentile Brethren that neither the Jews of that day, nor their ancestors could keep themselves. Peter told them they were tempting God in their demands. The Apostle James said the religious leaders were overthrowing the souls of the Gentiles. At the close of the meeting, James wrote a letter to the Gentile Believers and sent it to them by the hands of Paul and Barnabas, telling the Gentiles that the Apostles had given no such command that they keep the Law. He also sent Judas and Silas with the same words, but not written… they were to speak to the Gentiles, telling them that they were not commanded to keep the Mosaic Law. The Mosaic Law was part of an Old Covenant that was soon to pass away. In many Churches around the world today, there is a doctrine being taught that could be called “strange fire”. That doctrine is the monetary tithe requirement doctrine. No longer the agricultural tithe that was commanded by God for the children of Israel in Mount Sinai, (Leviticus 27:30-34) it is now a monetary tithe. No longer a tithe that was to be given to Levites, to widows, to orphans, to strangers in Israel, (Numbers18:24-26; Deuteronomy 14:22-29; Nehemiah 10:37-38) it is now to be given to pastors of Churches around the world. The “tithes” were good when God had control of them, but modern-day Nadab’s, modern-day Abihu’s have turned them into a “strange fire” which God never commanded. He is the same yesterday, today, and forever. Many pastors today are tempting God and putting a yoke upon their congregations that God never authorized them to do. Search the Scriptures. When you do, you will find that God’s holy tithe was never commanded for the New Testament Church, never carried to the New Testament Church, never collected in the New Testament Church, and never controlled by the New Testament Church. 2 Corinthians 9:6-7 But this [I say], He which soweth sparingly shall reap also sparingly; and he which soweth bountifully shall reap also bountifully. Every man according as he purposeth in his heart, [so let him give]; not grudgingly, or of necessity: for God loveth a cheerful giver. God does not require tithe of your money. Instead, He wants you to give simply out of your love for Him. Not as others dictate, but as you choose in your heart. Give with a willing heart; not because you have to, but because you want to… and He will be pleased. An excellent article on tithing written by Steven R. Cook, M. Div. I took this picture with my camera phone while passing through an apartment complex one day. The person living in the apartment apparently thought the message important enough to stick on the front of her door for others to read as they passed by. It certainly reveals her theology. 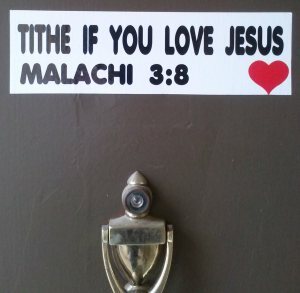 So, will you “tithe if you love Jesus”?